Item number 5115. A rare Girandole. 1845-1865. Indian Form also known as the "Warrior" model. The Indian holds a spear and is dressed in Indian attire. The figure is of an Osage Indian Chief modeled after a Catlin Portrait print. 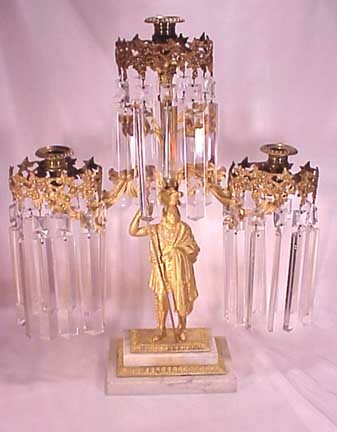 A similar example of this girandole is exhibited in the Philadelphia Fine Arts Museum Collection in their gallery of American Decorative Arts. Manufactured by Cornelius Co. of NY between 1845-65. On the center of his chest is a large 5 pointed star. The Indian has long hair and a feather plume head dress. Condition: the gilt finish is bright and intact; The lusters are period and have multiple edge flakes and all but three of the prisms are 5.75" long with the shorter ones 4" long. Parrott Bacot's book Nineteenth Century Lighting does not picture these Girandoles. Size: 19.5" tall. The stepped marble base is 4.75" x 7". The Indian is app. 9" tall. The girandole holds 3 candles. Price: $1,500.00. # 5044. A three piece set of American Girandoles. Commonly called the Bigelow Chapel Model manufactured by the William Shaw Company of Boston. Fully marked in the bronze back with the name, address and patent date. The single candle Girandoles are 14" tall mounted on an Egyptian Marble base which is 3.5" x 6.25". The Three arm unit is 16.25" tall on the same size and type of marble base. The prisms appear to be period to the Girandoles are are consistent with original material. 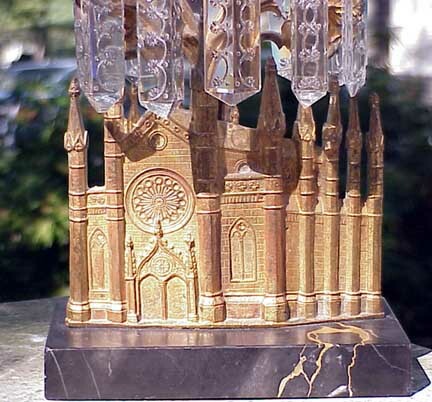 The prisms are commonly referred to as "interlocking C and star" prisms as described by H. Parrott Bacot in his book titled "Nineteenth Century Lighting" and this model girandole is pictured on page 188 of that book. Condition: slight discoloration to the gold gilt work of the chapel sections with more gold gilt wear to the prism supports and candle cups. All in all, this is a rare set of Girandoles in good condition. There are no repairs to the metalwork or marble. The prisms have small flakes consistent with use and age. There are no prisms missing. Each has a double button. The markings on the back state: "W. F. Shaw 174 Wash St. Boston Patent Dec 18, 1849" Shaw was located at 270 Washington Street in Boston from 1848 to 1851. We don't know when he was at 174 Washington Street: before or after the 270 address. We sold a similar set to The Rhode Island School of Design Museum a number of years ago and similar examples exist in the Sleep Hollow Restorations Collection and other important private and public collections. Price: $2,750.00 the set. # 4801. A single American Girandole. 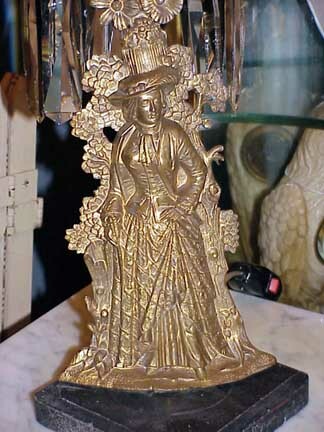 Incised mark "Cornelius & Co. Patent April 10, 1849" Commonly called the Colonial Lady model; made in Philadelphia this Girandole was sometimes coupled with a Colonial Officer Girandole. Mounted on a square painted slate base 5" square. The Girandole is 15.5" tall to the top of the candle cup. Fitted for electricity (can easily be unfitted with no drilling used in electrifying) with the shade and electric candle adding another 10" to the height. This form does represent Cora Munro a character from The Last of The Mohicans by James Cooper. The prisms are consistent in age and appear to be period to the Girandole. This patina is worn but there is some gilt finish left on the figure, less gilt finish on the stem and prism ring. The prism ring uses the bird decorative motif. This makes an attractive electrified candle lamp. Price is $550.00. Item number 4631. A rare pair of Girandoles. 1845-1865. Indian Form also known as the "Warrior" model. The pair are identical. Each Indian holds a spear. The American Indian is dressed in Indian attire. The figure is of an Osage Indian Chief modeled after a Catlin Portrait print. 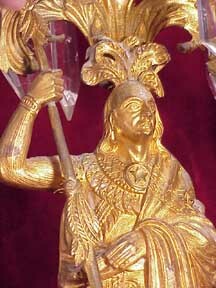 A similar example of this girandole is exhibited in the Philadelphia Fine Arts Museum Collection in their gallery of American Decorative Arts. Manufactured by Cornelius Co. of NY between 1845-65. On the center of his chest is a large 5 pointed star. The Indian has long hair and a feather plume head dress. Condition: This pair (which is from a New York City Townhouse) has original very dirty patina; The lusters are period and have multiple edge flakes. Each long prism is 7" long including the button and the shorter prism is 6" long including the button. Missing are 8 smaller prisms and 3 larger prisms. There is no loss to the metalwork. Parrott Bacot's book Nineteenth Century Lighting does not picture these Girandoles. In 30 years in the business this is our first pair like these. Size: 19" tall. Marble base is 4" x 6". The Indian is app. 9" tall. Each girandole holds 3 candles and there are two Girandoles. The candle luster holders are slightly bent. Price for the pair: $3,500.00.